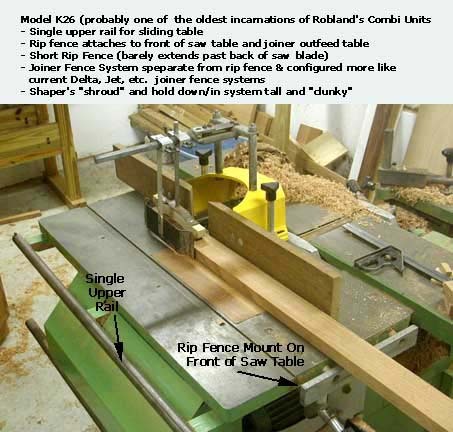 Robland has probably been making combination machines (tables saw. shaper, joiner, planer and horizontal boring and mortising) since the early 1950s and their machines have evolved slowly from the initial design rather than getting a periodic redesign. As a result, the basics of their combi looks, and operates basically like the original K26, with bolt on changes being made over the years to correct earlier problems or to accomodate "upgrades". Let's start with the K26, which I think is the earliest ancestor of today's X-31. This thing had a single upper rail on which the sliding table rode - with another rail BELOW it near the bottom of the unit. This severely limitied the "stroke length" of the sliding table - OK for cross cuts, not so good for cutting up 3x8 sheets of plywood, The shaper head "shroud"is open on top - a NO NO for today's EU equivalent of the United States OSHA safety standards. Note also the beefybar bolted to the front of the saw/shaper table. Though not shown in this photo, there's another one bolted to the end of the joiner's outfeed table. The table saw's rip fence attaches to these bars. The rip fence itself for these units is rahter short, but adjustable. 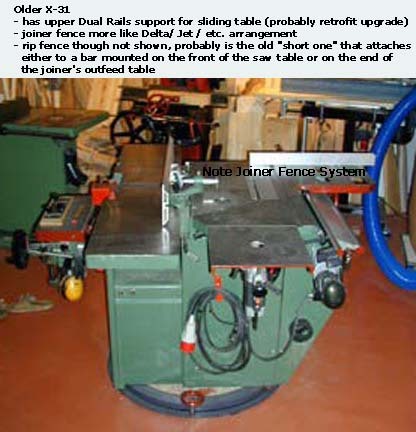 When mounted on the end of the joiner outfeed table, the fence, fully extended barely reaches the back of the saw blade when it's at it's maximum height. The older models also have a joiner fence system which is more like the U.S. market joiner fences - a beefy bolt on "base" with an extruded aluminum fence. That's shown in this next picture. Ignore the router table top bolted on the back of the saw/shaper table - that's an add on you can put on any X31. The thing to note in this pic is the joiner fence system. Though relatively short compared to later joiner fences, it's pretty robust relative to later incarnations. 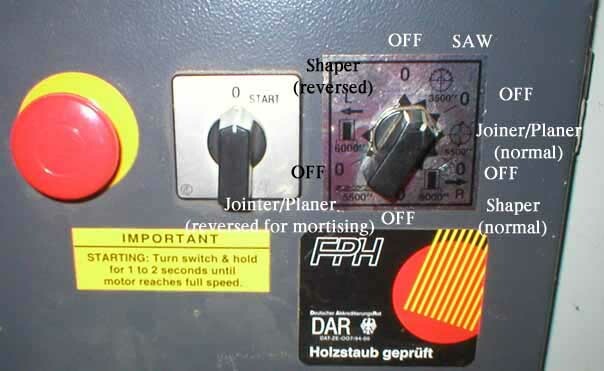 Note that the '99 version has a reverese for the joiner/planer/mortiser - which lets you use "regular" drill and mortising bits (or normal end mills) in the chuck - or after market collet - on the end of the joiner/planer cutter head. In retrospect, I wonder why LT told me I had to use their "special" mortising bits.